Note: Due to a re-routing of Wis. Hwy. 164 in 2005, Hwy. 164 used to be County Hwy. J, and County Hwy. F used to be Hwy 164. Older maps (and Yahoo! maps) may not reliably show this change. - Take I-94 West toward Milwaukee (heads north from Chicago, signs say West). - Coming in to Milwaukee area be in left lanes for I-894 West around Milwaukee toward Madison (just past Mitchell Field International Airport exit). 10 miles on I-894 be in left lane for I-94 West toward Madison (just past Greenfield Ave. exit). - 10 miles on I-94 exit #294 Wis. Hwy 164 North / County Hwy J (just past Hwy F.), and turn right at the end of the off-ramp. (Note that Wis. Hwy 164 South will be a different exit). - Take I-94 East toward Miwaukee. - Exit #294 Wis. Hwy 164 North / County Hwy J (just past Hwy. T / Grandview Blvd. ), and turn left at the end of the off-ramp. 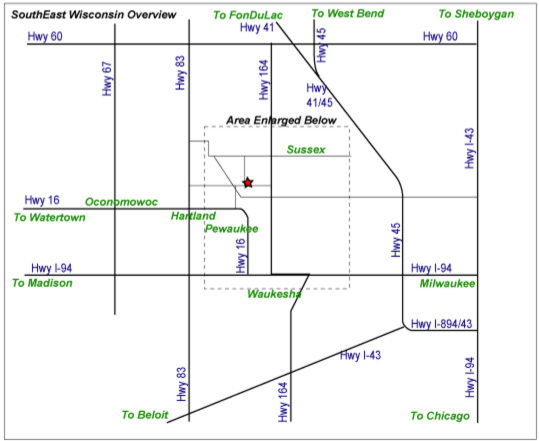 (Note that Wis. Hwy 164 South will be a different exit). - 5.5 miles on Hwy. 164 North, turn left (west) on Richmond Rd. (first left past County Hwy K - look for the white Sussex water tower, just before Richmond Rd.). - 1.0 miles on Richmond Rd., turn right (north) on Mary Hill Rd. You can only turn right, we are on the corner, take first driveway to the right. - At the intersection of Wis. Hwy 60 and U.S. Hwy 41, go west on Hwy 60. - 0.5 miles from Hwy 41, turn left (south) on Wis. Hwy 164 (at stop lights). - 14.4 miles on Hwy 164, turn right (west) on Richmond Rd. 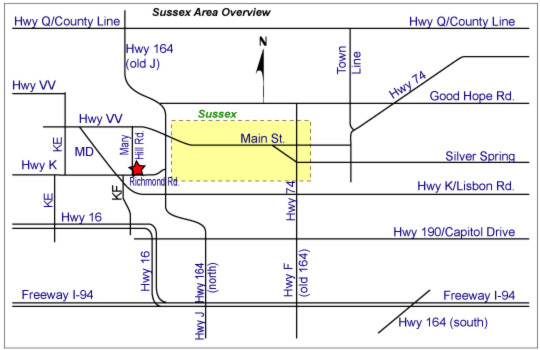 (first right past intersection with County Hwy VV - look for the white Sussex water tower, just before it is Richmond Rd. ).